The furnace is the heart of a cozy and comfortable home. Regular do-it-yourself maintenance can keep your heating system humming along for years to come, saving you money on fuel and costly repairs and even prolonging the life of your furnace. If you haven’t already done so, schedule an annual system tune up with an HVAC professional. They will clean and maintain the system to make sure it is running safely and efficiently. Replacing a dirty air filter with a clean one can lower your furnace’s energy consumption – and ensures that the air you and your family breathes is clean. As the filter traps more dirt, dust, and allergens from the air, filter efficiency decreases. How often it needs to be replaced depends on the type of furnace and the type of filter you use – some need to be changed monthly, while some can last up to six months. If you have pets or if anyone in your home has allergies, the filter will need to be changed more often. A good rule of thumb is to inspect the filter monthly. If it looks dirty, it’s time to change it. Uninsulated ducts can allow hot air to escape, heating areas that don’t need to be heated – like basements, attics, and crawl spaces – and keeping warm air from reaching living spaces. According to the US Energy Efficiency and Renewable Energy office, these leaks can add hundreds of dollars a year to your heating and cooling bills, but you can reduce that loss by sealing and insulating ductwork. Fortunately, adding duct insulation is a relatively easy process. Start by checking the ductwork for air leaks, particularly around joints or connections, and cover them metallic foil duct tape, which is made to stand up to extreme temperatures. 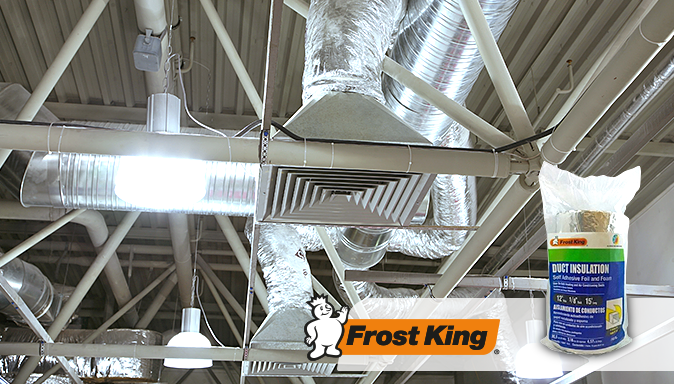 Use a foil-faced fiberglass insulation, like Frost King Self Adhesive Foil and Foam Duct Insulation, and cut it to size; wrap the insulation around the duct and apply tape along the seams to secure it firmly without compressing the insulation. Be sure to check that all exposed seams and joins are thoroughly covered with tape to seal out moist air that could cause condensation on insulated ducts.